Martinique filmmaker Patrick Baucelin presents CD of his work to Ministry of Tourism permanent secretary Richard Madray. MARTINIQUE filmmaker Patrick Baucelin visited Port of Spain on Wednesday to produce a documentary called Churches and Cathedrals in the Caribbean Land. Baucelin was among 3,643 passengers and 1,266 crew who arrived on the MSC Preziosa Cruise line. He also visited the Ministry of Tourism and presented a book and CD on his work to Permanent Secretary Richard Madray. 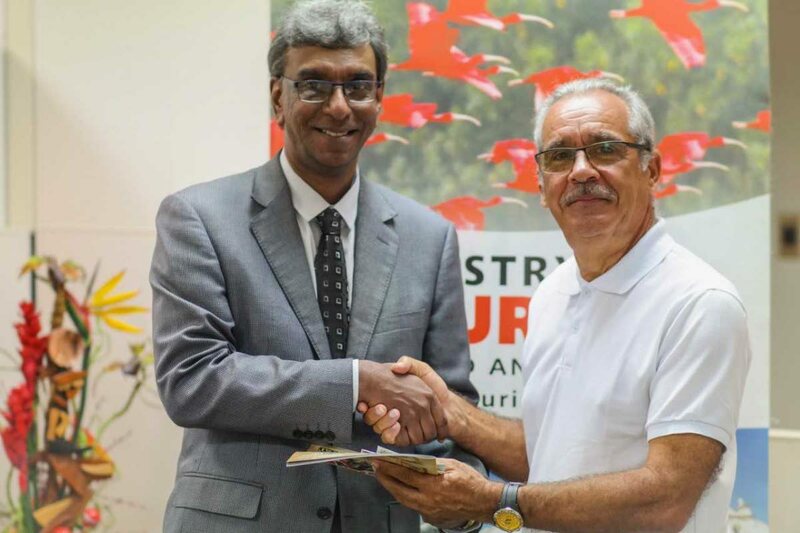 Baucelin’s visit was facilitated by the Ministry of Tourism in collaboration with the Caribbean Tourism Organisation (CTO). He has produced several award-winning documentaries on the Caribbean, which he shares with schools, libraries and tourism offices. His documentaries are also shown to international audiences. In 2017, he received the CTO’s Lifetime Achievement Award, for his work in promoting the Caribbean through film. During his visit, Baucelin visited the Cathedral of the Immaculate Conception and the monastery at Mt St Benedict, Tunapuna. Reply to "Martinique filmmaker visits TT for documentary"